Gatherhaus is connected with Project Sweetie Pie and Fresh Starts Farm to a community garden on Minneapolis’s north side. More than being an urban farming adventure, the goal for this little piece of city property is to bring neighbors together. The corner where the garden is located has a strong history of high violence and drug deals. This community project values people and relationships, building community to foster hope and give people a place to connect. 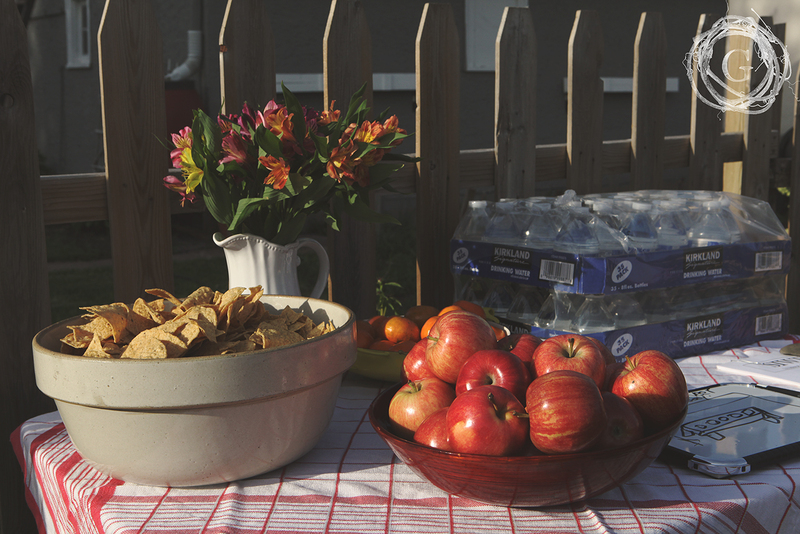 As planning for the crops were in process, we knew that if we were going to create a place for people to gather together and have conversations, they needed a place to sit and be, to share a drink and get to know one another. There were quite a few ideas thrown around, but in the end we decided on a one piece picnic table, meaning the benches are connected to the table. This would ensure its stability and longevity at the property. 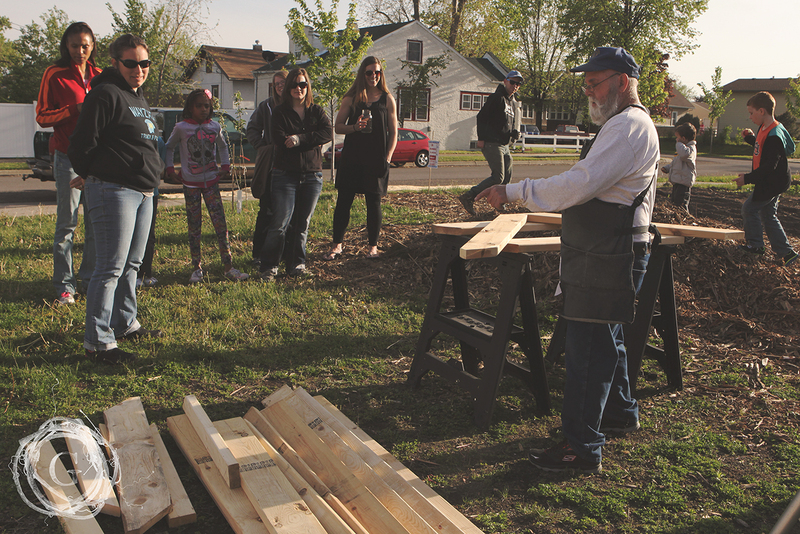 We enlisted the help of our local woodworker, Bill Moore, president of the Camden Lions (who help sponsor the garden) to lead us in a class held at the garden on how to build a picnic table. 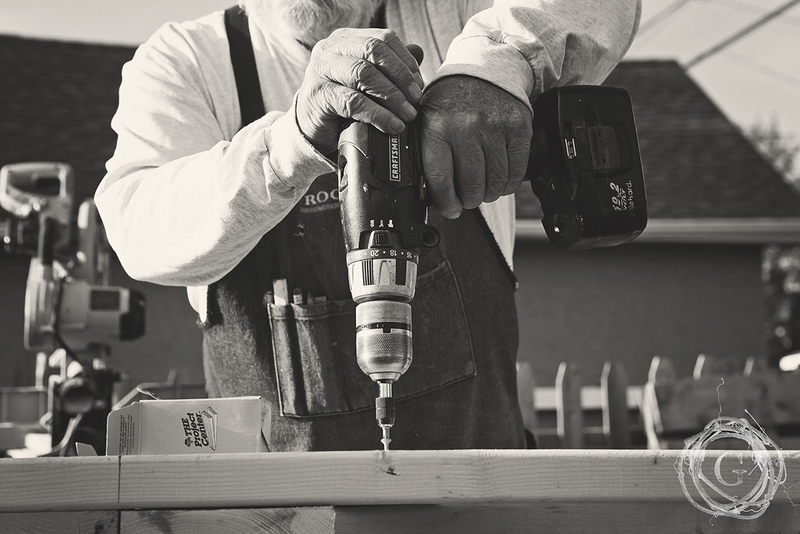 Instead of scouring for a used table, we knew the best way for neighbors to meet neighbors was to work on a project together. A project where we each learned something, and the end result benefited the garden project, and thus effectively each one of us. Bill came armed with the supplies necessary for a successful class. He brought printed out instructions and pre cut wood. He also came armed with the frame of our community event sign that needed to be installed to give able hands something to do.There were quite a few who came, so hands on participation was limited. However, with an easy print out, most of us gained the knowledge we were lacking prior to the class to make a successful table at home when we were ready. Click on the link above for the picnic table blue print, where there are easy step by step instructions and a list of supplies needed. Instead of rehashing what is already on the hand out, I want to share 7 things I learned from participating in this building project. Having someone who has experience in the skill you are learning greatly increases the knowledge you will gain. When things go wrong, and you know they always do, your mentor will have greater insight in how to correct the situation. You will also have a leader who can answer questions with wisdom and life experience. Learning a new skill with friends makes the process so much more fun and enjoyable! Everyone has different viewpoints and therefore different questions to help round out what you learn. Plus, the added bonus is that others might also have creative and different ways to work on the project. More folks = more learning. Having people help build the picnic table for the community garden that they will be volunteering at nurtured their commitment to the project. 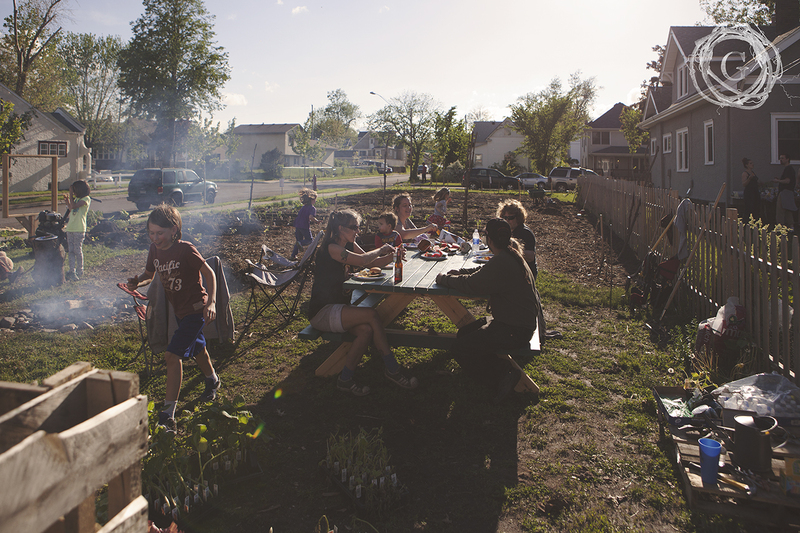 This garden is, in part, to foster community and bring people together. Getting folks to help build a project that will create community, in and of itself already started the process. There may be nothing I love more than having folks that would have never found a reason to hang out before, come together and share stories, laughter and common ground. The group was eclectic, but by the end, new friendships were formed. We were brought together to create something. And we did, not just a table but the relationship foundation for the garden. When you bring all sorts of people together, more stuff gets done. 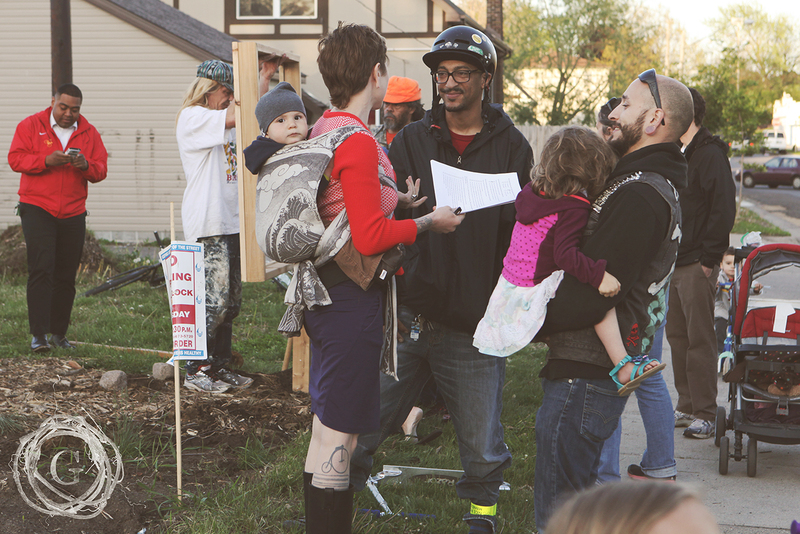 When folks found themselves standing idle, out came the community event sign, and up it went. People started even coming out of their homes to see what was happening. Not only did the table get built, but our sign went up! Mentorship to kids is a critical life value. I loved watching these men who were leading the project include the kids that were there. They didn’t just instruct, showing them what to do, they encouraged them to get involved. They handed them measuring tools, power tools, and empowered them not just with knowledge, but experience. The kids that showed up that day were a part of the problem solving solution. They were given a gift of trust and independence and skills. Problem solving skills, building skills, power tool skills, safety skills, leadership skills, listening skills, sharing skills, it feels the list is endless. I was so impressed with the way these men handled the kids, and included them, encouraging them to do more as they lent their knowledge and guidance. The great thing about working on projects together is that your arsenal of tools and resources grows significantly. I don’t personally own a library of power tools, however Bill, our local wood worker and community volunteer, does. I don’t need to go out and purchase a ton of new supplies spending more money than I have. It is therefore prudent and resourceful, honoring and respectful of folks finances and it allows more folks to get involved fostering community and deepening relationships. Overall, this project accomplished a great many things. It brought folks together, provided knowledge in learning a new skill, and while we had a couple dozen folks at the garden, we hosted an event that was hopeful and took a giant step forward in creating a space for neighbors to get to know one another and change their community for the better. Where Bill donated his expertise and time to the project, Siwek Lumber and Millwork donated the wood, and North End Hardware gave a huge discount to the hardware needed. It was incredibly encouraging to be supported by local business, lending their help in our effort to create a more connected community. Thank you to all who supported the project, who came out and learned and offered advice, and to all the business and organizations connected to our efforts. Building stronger connected communities takes all of us. Learning and teaching each other life skills is always better when done together. Enjoy building your picnic table, and make sure to enlist the help of friends and neighbors to make the experience more fun and hopefully more productive!